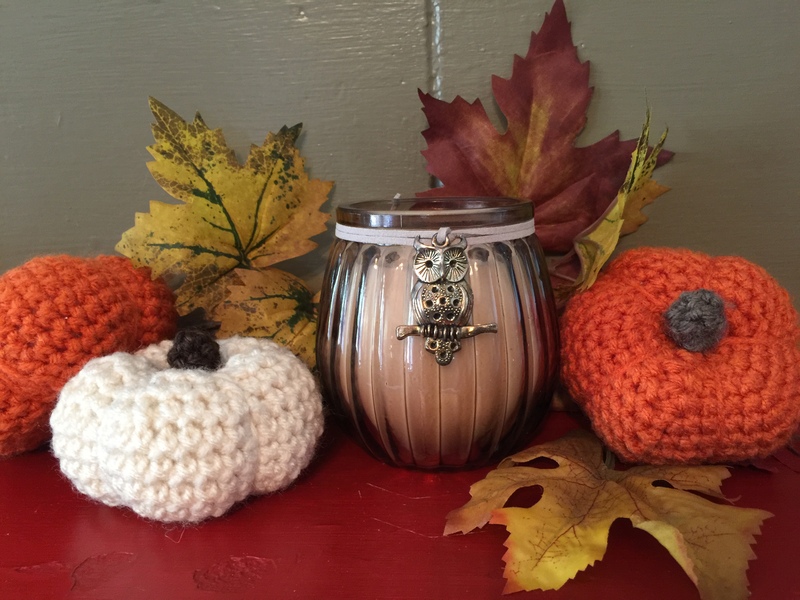 Pumpkins and Owls kind of go together don’t they? I was so proud of my first little crocheted pumpkin that I made two, then three! One in off-white and two in orange. You can crochet these in no time! Who needs to buy real pumpkins when you can make these cute little crocheted pumpkins for fall home decor? I used the free pattern below – which I found here. Using orange, create a magic ring. Round 1: Ch 1 (does not count as st), 6 sc in ring, join — 6 sts. Round 2: Ch 1 (does not count as st), work 2 sc in same st as join and in each st around, join — 12 sts. Round 3: Ch 1 (does not count as st), work 2 sc in same st as join, 1 sc in next, *2 sc in next, 1 sc in next, rep from * around, join — 18 sts. Round 4: Ch 1 (does not count as st), work 2 sc in same st as join, 1 sc in each of the next 2 sts, *2 sc in next, 1 sc in each of the next 2 sts, rep from * around, join — 24 sts. Round 5: Ch 1 (does not count as st), work 2 sc in same st as join, 1 sc in each of the next 3 sts, *2 sc in next, 1 sc in each of the next 3 sts, rep from * around, join — 30 sts. Round 6: Ch 1 (does not count as st), work 2 sc in same st as join, 1 sc in each of the next 4 sts, *2 sc in next, 1 sc in each of the next 4 sts, rep from * around, join — 36 sts. Rounds 7 through 11: Ch 1 (does not count as st), work 1 sc in same st as join and in each st around, join — 36 sts. Round 12: Ch 1 (does not count as st), starting in same st as join sc2tog, 1 sc in each of the next 4 sts, * sc2tog, 1 sc in each of the next 4 sts, rep from * around, join — 30 sts. Round 13: Ch 1 (does not count as st), starting in same st as join sc2tog, 1 sc in each of the next 3 sts, * sc2tog, 1 sc in each of the next 3 sts, rep from * around, join — 24 sts. Round 14: Ch 1 (does not count as st), starting in same st as join sc2tog, 1 sc in each of the next 2 sts, * sc2tog, 1 sc in each of the next 2 sts, rep from * around, join — 18 sts. Round 15: Ch 1 (does not count as st), starting in same st as join sc2tog, 1 sc in next st, * sc2tog, 1 sc in next st, rep from * around, join — 12 sts. Round 16: Ch 1 (does not count as st), starting in same st as join sc2tog around, join — 6 sts. Round 17: Ch 1 (does not count as st), starting in same st as join sc2tog around, join — 3 sts. Fasten off leaving a tail of about 48 in. To create a pumpkin shape, use a tapestry needle to pull the tail through the center of the pumpkin, wrap the yarn around the side, and pull back through the center. Give a gentle tug to make a slight indent. Repeat this five more times to create evenly spaced indents around the pumpkin. If desired, you can go around again, working over the same yarn indents until you get the result you want. Using brown, create a magic ring. Round 1: Ch 1 (does not count as st), 6 sc in ring — 6 sts. Round 2: 1 sc in first st and each st around — 6 sts. Round 3: 1 sc in first st and next 4 sts, Sl st in last — 6 sts. Fasten off leaving a long enough tail to sew stem to pumpkin. Sew stem onto pumpkin.